The chariot carrying Durga is brought through the streets of Little India, in George Town, the capital of the Malaysian state of Penang. 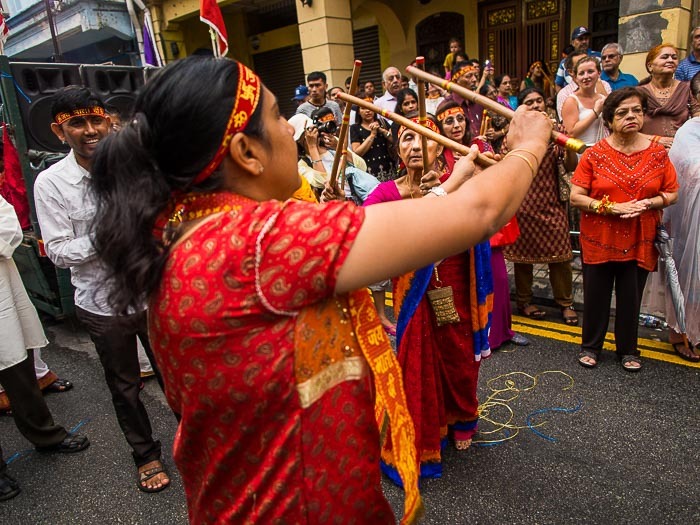 We happened to be George Town for Navratri, a nine day Hindu festival that honors the deity Durga. Navratri roughly corresponds to the Taoist "Nine Emperor Gods" holiday which is also celebrated in George Town. (George Town is a remarkably diverse city with large Muslim, Hindu, Buddhist, Taoist, and Christian populations.) Coincidently it was also the Muslim holy day of Eid Al Adha, and Jewish New Year, Rosh Hashanah. Almost every one of the word's big religions (with the exception of Christianity) had something to celebrate this weekend. Hindus pray as the chariot bearing Durga passes them. 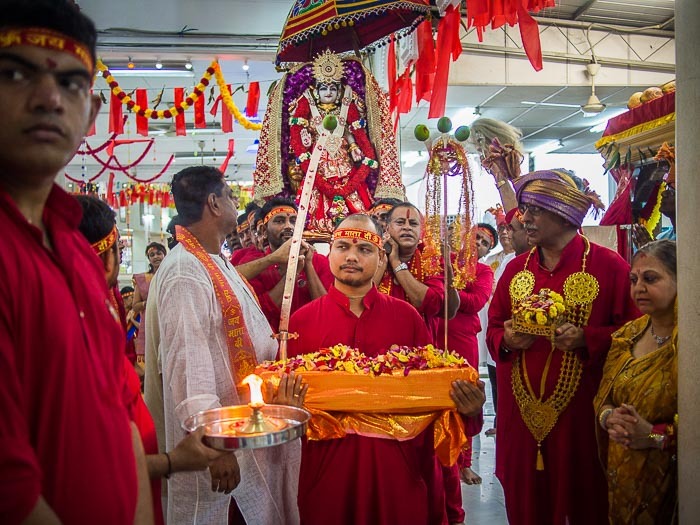 Navratri is celebrated with processions throughout the community. In a community with a large Hindu population, like George Town, this can mean a lot of processions. We got into George Town late Saturday evening, went walk about and stumbled into a procession winding its way through Little India. 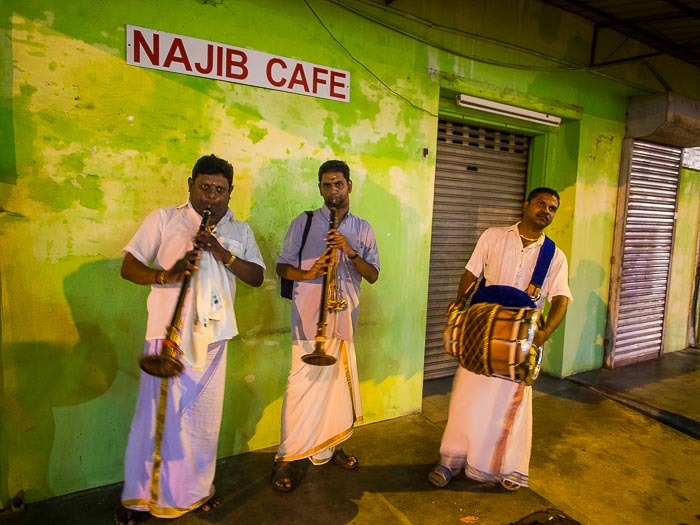 The band leading the procession performs on a Little India sidewalk. I followed the procession for about an hour and then went back to our hotel room to edit. The next day we went walk about in another section of downtown George Town and bumped into a second Navratri procession headed down Campbell Street, one of George Town's best preserved historic streets. 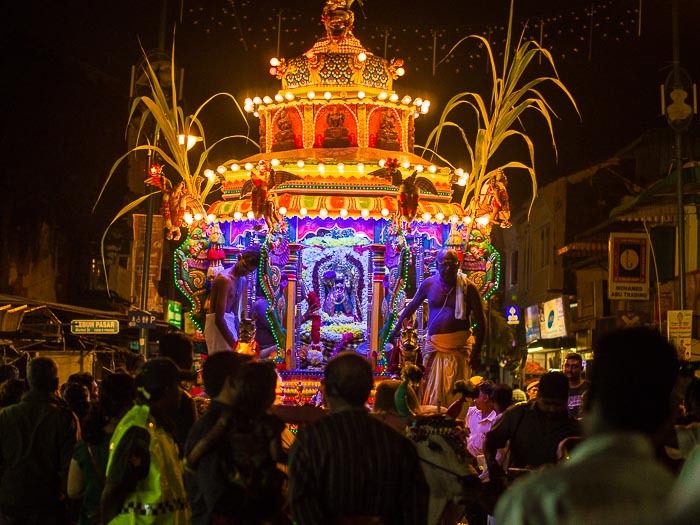 The Durga deity is brought out of George Town's Krishna temple to the waiting chariot. I photographed this procession for a couple of hours as it slowly made its way through George Town. The procession on Penang Street near the corner of Campbell. 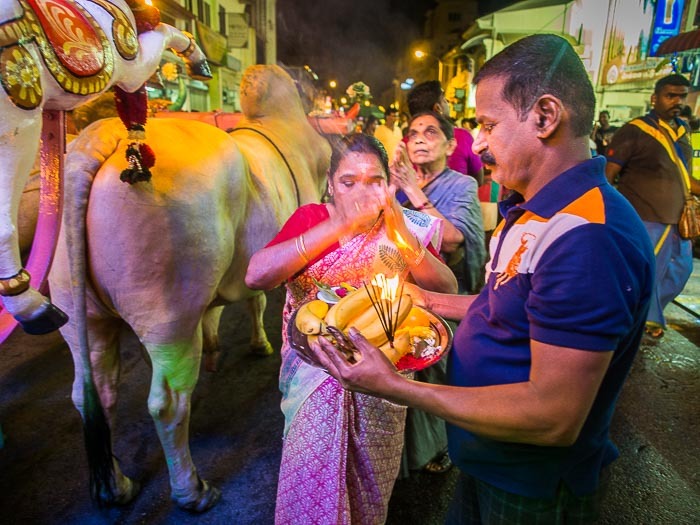 Thanks to the Indian diaspora, there is a large Hindu population throughout Southeast Asia. In the 1800s, British colonial authorities brought Indian civil servants to Muslim Malaysia and Buddhist Burma and Indian merchants settled in Thailand. With just a little effort, it's easy to find Hindu celebrations to participate in. There are more photos from the Navratri processions in my archive or available from ZUMA Press.